Hello Sivan. Your attempts to get APRS packet decoding are interesting. In general, I would expect that software DSP packet decoders should work better than most hardware TNCs which are based on what is quite old technology. They should decode under worse S/N conditions. However there are a few things that can throw a spanner in the works of sound card decoding. One is the clock speed (true sample rate) of the sound card. If this is a few percent out the baud rate will be incorrect and this can cause failed decodes. I would recommend that you try MixW. It has a program (CheckSR.exe) that can be used to detect the sample rate error. It can also display the measured baud rate of received packets. If you see other than 1200Hz some correction is required. Unfortunately AGWPE is one program that cannot correct for sound card sample rate error. Other things that can cause a problem is receiving through too narrow an IF filter ( we usually use Wide FM settings here) and the wrong de-emphasis on the audio. Here http://www.febo.com/packet/layer-one/transmit.html is an article about audio levels. The 2200Hz tone should have twice the amplitude of the 2400Hz tone. A series capacitor may help here. Thanks a lot Julian. I tried to decode packets using two different computers with both the built-in sound cards and USB sound cards, so I don’t think that the problems were due to the sampling rate, but I’ll definitely check these. I did not use a narrow IF filter, but in many of the experiments I used an isolated sound-card interface; perhaps the transformers attenuate parts of the audio spectrum. I’ll take a look. I had the same problem with my HT ,mainly because it doesn’t have a discriminator output and deemphasis prevented my soundcard software from decoding APRS packets. and put it in line with my HT audio output.Now the audio coming out of my soundcard interface is very low HIx3 but it is easily manageable with the built-in amp of the mic input of my souncard. Anyway, using different soundcard software (AGWPE, Flexnet…) I can decode almost every packet I hear, It works as well as my TM-D710 or my TNC2 wired on a FT-817. 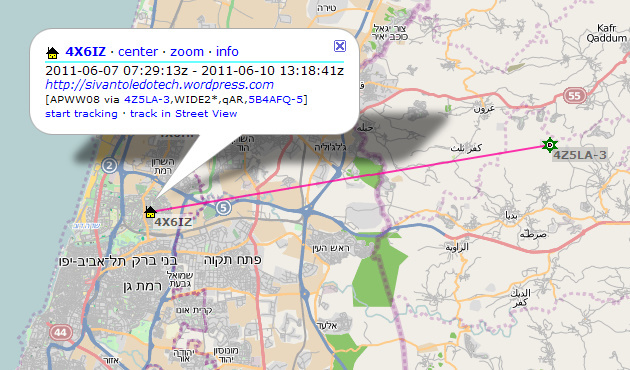 Therefore my question is how I can decode and next see the APRS data from my APRS mini tracker on the internet to check if it is sending its messages in a good way. Perhaps I have made a wrong choice of the callsign and its suffix?? Next I wonder if this callsign needs to be registered somewhere to get noticed on APRS google maps sites. Or do I need a license to send and receive APRS data? I use 144.800 MHz of the Radiomterix HX1. Actually I am puzzled about what I am doing wrong. Could you please give me some help/suggestions here? P.S. I am investigating the use of APRS in wildlife monitoring applications.